The sirkeer malkoha (Taccocua leschenaultii) belongs to the family of cuckoos and malkohas, Cuculidae. The sirkeer malkoha species are distributed in India, Pakistan, Nepal, Bhutan, Bangladesh and Sri Lanka. These malkoha species are non-parasitic and build their own nests. These malkohas are polytypic species. The sirkeer malkoha (Taccocua leschenaultii) is a medium-sized malkoha, measuring about 45 cm in length and weighing about 175 grams. The adult sirkeer malkoha has sandy brown head, neck, throat and upperparts. The breast and belly region are sandy-rufous. The long tail is brown and graduated. The tail feathers have broad white tips. The bill of the sirkeer malkoha is hooked, bright cherry-red in color with yellow tip. The irises are blackish. The feet are pale gray. Both the male and female have similar plumage. The juveniles have duller plumage. Their call is an occasional shrieking, "kek..kek..kek" or a subdued "bzuk..bzuk" sound. These sirkeer malkoha species are distributed in India, Pakistan, Nepal, Bhutan, Bangladesh and Sri Lanka. 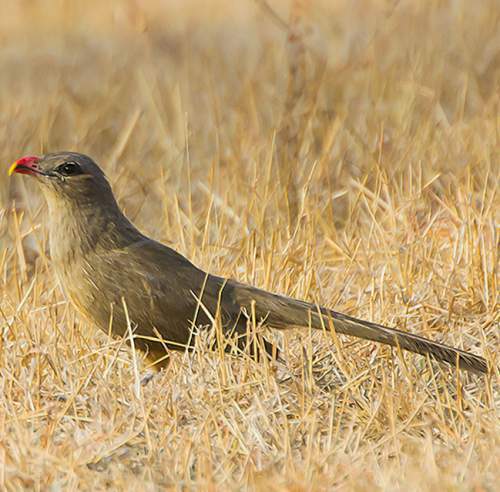 In India, these sirkeer malkoha species are distributed in most of the states. But they are very rare or absent in the desert regions of Rajasthan, snow-bound regions of northwestern India and also most of northeast region of India. 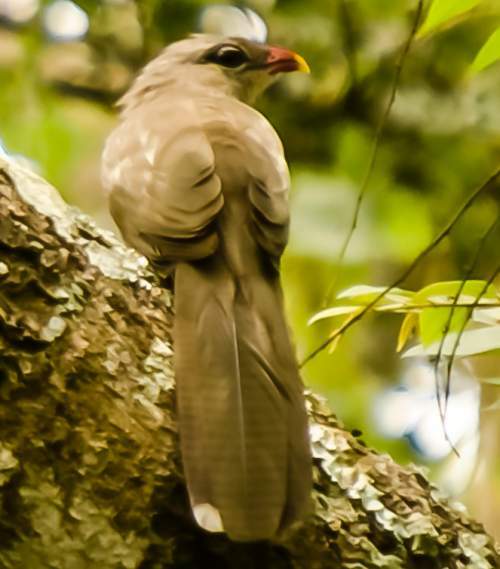 The sirkeer malkoha nominate subspecies T. l. leschenaultii is distributed in southern India and Sri Lanka. The subspecies T. l. sirkee is distributed in Pakistan and northwest India. The malkoha subspecies T. l. infuscata is distributed in sub-Himalayan India, Nepal, Bhutan and Bangladesh. Their southern distribution is limited to south central Maharashtra, northern Telangana and northern Andhra Pradesh. The Important Bird and Biodiversity Areas (IBA) of the sirkeer malkohas in Nepal are, Bardia National Park, Chitwan National Park, Dharan forests, Ghodaghodi Lake, Parsa Wildlife Reserve, Sukla Phanta Wildlife Reserve and Barandabhar forests and wetlands. These sirkeer malkoha species have moderate forest dependence. They normally occur in altitudes from 0 to 1000 meters. Their artificial ecosystems and habitats of include tea and rubber plantations. The natural ecosystems and habitats of these malkoha species include tropical and subtropical dry lowland forests, dry deciduous secondary forests, dry montane forests and dry shrublands. The diet of sirkeer malkoha consists mainly of large insects. Caterpillars, grasshoppers, crickets, mantids, locust, caterpillars, cicadas, termites are their primary food. These malkohas are known to prey on lizards. They also feed on berries and fruits. They forage mainly on the ground. Occasionally, they glean their prey from the foliage and branches of trees. The breeding season of the sirkeer malkoha species is from June to September in India. The laying season is during June and July in Sri Lanka. They are monogamous and territorial. The nesting sites include thorny bushes like Euphorbia spp. or fork and branches of short trees, 2 to 7 meters above the ground. The nest is a shallow saucer of twigs and sticks, lined with green leaves. Both of the malkoha pair take part in nest building, incubation and care of young. The typical clutch contains two white eggs of chalky texture. The hatchlings are altricial, born blind, naked and incapable of movement. 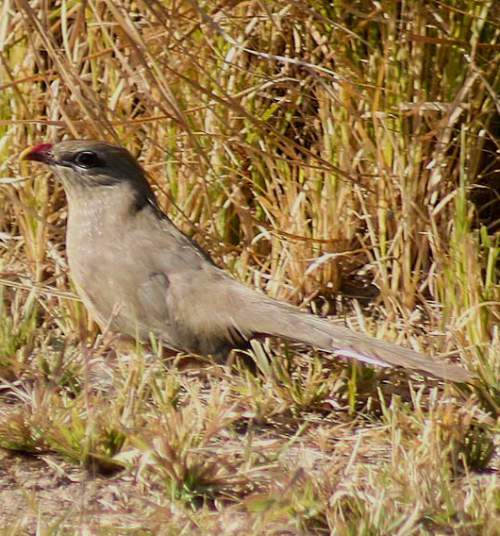 These sirkeer malkoha species are non-migratory, resident birds. The birds in higher altitudes move to lower levels and plains during winter. Post breeding, the juvenile malkohas may disperse and establish in new locations within the range. They may make local movements for feeding and breeding within their range. The global population size of the sirkeer malkoha (Taccocua leschenaultii) has not been quantified. The overall population trend of these species is considered to be stable. Throughout its range, this malkoha species is reported to be uncommon to rare. The generation length is 4.2 years. Its distribution size is about 3,960,000 sq.km. Habitat alteration and destruction, deforestation and capture for pet-trade are the main threats that may endanger the survival of these malkoha species. The sirkeer malkoha (Taccocua leschenaultii) does not approach the thresholds for being Vulnerable either under the range size criterion, or under the population trend criterion or under the population size criterion. The IUCN (International Union for Conservation of Nature) has categorized and evaluated the malkoha species and has listed it as of "Least Concern". The CITES (Convention on International Trade in Endangered Species of Wild Fauna and Flora) status is ‘Not Evaluated’ for sirkeer malkoha (Taccocua leschenaultii). The sirkeer malkoha (Taccocua leschenaultii) are lumped into genus Phaenicophaeus by some authors. The three recognized subspecies of the sirkeer malkoha (Taccocua leschenaultii) are: Taccocua leschenaultii leschenaultii Lesson, 1830, Taccocua leschenaultii infuscata Blyth, 1845 and Taccocua leschenaultii sirkee (J. E. Gray, 1831). Current topic in Birds of India: Sirkeer malkoha - Taccocua leschenaultii.